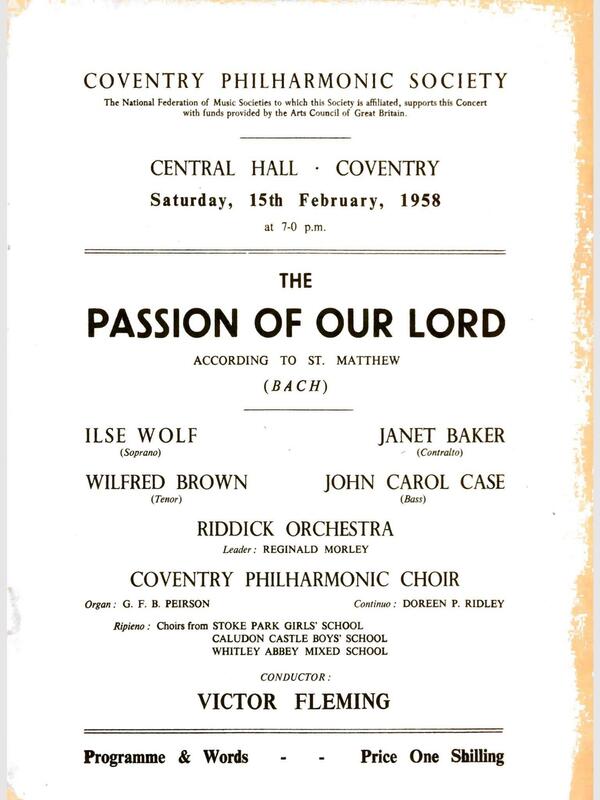 We have a wonderful archive of newspaper articles and old Coventry Philharmonic programmes and the latest ferret in the vaults unearthed this lovely concert from 1958. The soloists became household names in their lifetimes and, although Janet Baker was at the start of her career, the other soloists were established performers. And that got me thinking it’s not WHAT you know, it’s WHO you know. In 1958, the President of the Coventry Philharmonic Society was none other than Ralph Vaughan Williams. Was he instrumental in attracting such high calibre soloists? Ilse Wolf was born in 1921 in Düren, Germany, but came to England just before the Second World War, fleeing Nazi persecution. Her soprano singing career really launched in 1945 and alongside her concerts she was very involved in teaching in the RAM, Trinity College and Morley College. She died in 1999 having built an international reputation performing Lieder and oratorios. Janet Baker was born in 1933 in Hatfield, Yorkshire. As a young member of Leeds Philharmonic Choir, she sang as a soloist in Haydn’s Nelson Mass in Leeds in 1953 with Ilse Wolf as the soprano soloist. Persuaded by Wolf, Baker transferred to London and began a very successful singing career. Michael Kennedy, the renowned music critic, wrote about Baker’s career saying “It was about this time (1957/8) that I first heard her, having been tipped off that it would be worth attending the concert as a critic just to hear her in the St Matthew Passion. It was.” Was he talking about the February 1958 performance of the St Matthew Passion? Janet Baker was made a Dame in 1976 some 18 years after her appearance with the Coventry Philharmonic. Wilfred Brown was born in 1921 in Horsham, Sussex. He taught at Bedales School before becoming a full time singer in 1951, going on to become an accomplished English tenor much favoured by Finzi and Vaughan Williams. He specialised in Oratorio and Folk Songs. Sadly he died in 1971 at the height of his career. John Carol Case was born in 1923 in Salisbury, Wiltshire, and became one of England's leading baritones in oratorio and lieder. In the mid-1950s he became associated with all the great choral societies and festivals and was best known for his many performances of the part of Christ in Bach's St Matthew Passion. In 1948 a teaching colleague put him forward as the soloist in Vaughan Williams’ Fantasia on Christmas Carols, with the composer himself conducting. Other performances directed by the grand old man of British music followed, not only of his own compositions, but also of the St Matthew Passion, in his home town of Dorking, Surrey. Carol Case died in 2012. We still have many wonderful soloists perform with us and no doubt some of them will, in the future, be held in the same high regard as our stellar performers from the past .